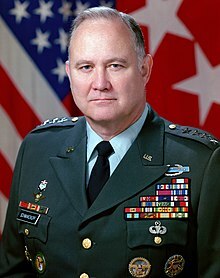 Herbert Norman Schwarzkopf, Jr. (August 22, 1934 – December 27, 2012), also known as Stormin' Norman, was a United States Army 4 Star General who, while he served as Commander-in-Chief (now known as "Combatant Commander") of U.S. Central Command, was commander of the Coalition Forces in the Gulf War of 1991. A professional soldier understands that war means killing people, war means maiming people, war means families left without fathers and mothers. All you have to do is hold your first dying soldier in your arms, and have that terribly futile feeling that his life is flowing out and you can’t do anything about it. Then you understand the horror of war. I believe that forgiving them is God's function. Our job is to arrange the meeting. Frankly, any man that doesn't cry scares me a little bit. I don't think I would like a man who was incapable of enough emotion to get tears in his eyes every now and then. That type of person scares me. That's not a human being. This page was last edited on 27 January 2019, at 13:35.